I didn’t always know how to make Cuban black beans soup. In fact, I wasn’t much of a cook. When I was younger I had little interest in cooking, so I never got the chance to learn from my mother before she passed away. Growing up my specialty was pasta because it was delicious and easy to make. To top things off, I was a picky eater. Coincidently, the second dish I learned to make was Moros y Cristianos, a Cuban Style rice dish made with black beans. Moro was my absolute favorite growing up. I was in my late teens when my grandmother first taught me to make that quintessential Cuban recipe. Back then, I always used canned black beans instead of dried ones. I had no clue how to cook beans from scratch. Honestly, most of the time, I viewed cooking as a chore. Plus, I feared the pressure cooker. It wasn’t until after I started living on my own that my love for cooking blossomed. When I got married, my cooking skills were limited. I’m grateful that my mother-in-law took it upon herself to teach me everything she knew. She taught me how to use a pressure cooker and by doing so opened up a whole new world for me. I loved my mother in law’s Cuban black bean soup so much that it was the first recipe she taught me. As I became a more seasoned cook, I developed my own way of doing things. Nonetheless, this recipe evolved from the Cuban black bean soup recipe she taught me to make 8 years ago. Like most countries, Cuba is diverse, and every region has a way of cooking that is slightly different from the next. There are many variations of typical Cuban dishes. This Cuban black bean soup is slightly different from the one served at my house while I was growing up. 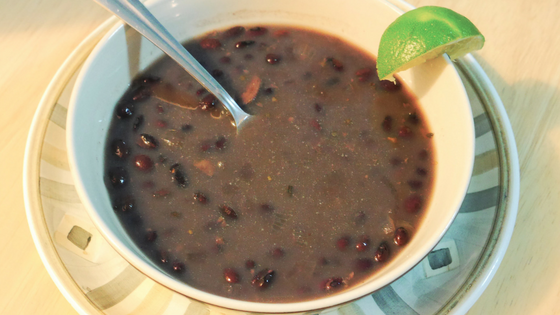 Cuban black bean soup is typically a vegan dish. But the ingredients that go into the soup vary depending on what’s available. For example, I’ve been told that garlic and cumin can sometimes be hard to find in Cuba, depending on the season. Likewise, my mother-in-law adds smoked pork knuckles to her black beans. Black beans are one of the most common types of beans you will find in any Cuban cuisine restaurant. They are also popular throughout Latin America. With 74% carbohydrates, 23% protein, and 3% fats they are a great source of fuel for our bodies. One cup of black beans contains around 15 grams of protein without a lot of saturated fat. Black beans are nutritious and are a wonderful source of phytonutrients. Like most beans, they contain a good dose of fiber and folate. In addition, they are rich in molybdenum, folate, manganese, vitamin B1, phosphorous, potassium, magnesium, and iron. They contain copper, potassium, zinc, vitamin B2, vitamin B6, calcium, pantothenic acid, vitamin B3, and selenium in smaller amounts. If you want to know more, last week I posted about the health benefits of beans. Aside from all the weight loss and cardiovascular health benefits, they are delicious! Healthy and delicious: How can you compete with that? Cuban and Vegan, these are the best black beans. This recipe is great for making in advance to eat throughout the week. It freezes well, too. Rinse the black beans and add them to a 5-8-quart pressure cooker. Fill the pot with water about halfway. Cover and seal pressure cooker according to the manufacturer’s instructions. Cook for 25 minutes*. While the beans are cooking, prepare the sofrito. Dice the onion and pepper and mince the garlic and herbs. To cook the sofrito, heat a small pan over medium heat. Add onions and peppers, adding liquid as needed so they don't stick*. Set the sofrito aside while the beans finish cooking. Once the black beans have been cooking for 25 minutes make sure they are soft. With a potato masher, mash the beans a bit to help thicken the soup*. In the same pot, add the bay leaf, white cooking wine, liquid smoke, and sofrito. Stir and bring to a boil. After about 10 minutes, add the salt and sugar. Cook for another 2 or 3 minutes and it's ready to serve. Pressure Cooker: Using a pressure cooker speeds up the cooking time but is not necessary. If not using a pressure cooker, cook beans until soft and then proceed to step 2. Cooking with Oil: Typically, the sofrito is sauteed in oil. I prefer using extra virgin olive oil towards the end of the cooking process (step 5) in order to use less oil. Texture: Using a potato masher to thicken the soup is completely optional. You can leave it as is or use any method to mash the beans.